I love chole (Channa masala) and it;s a favorite at home. This with puri, and some days I get lazy and make rotis. Not a particular cook,but I tweak things here and there and occasionally surprise myself with what I manage to put on the table. That said, I had pulled out the slow cooker from the top shelf in the pantry (where its been sitting for a few years now) to make some winter soups and I remembered how we simmer and slow cook many gravy dishes just so the flavor soaks in and it’s rich with the spices and bursts on your tongue with the bite. 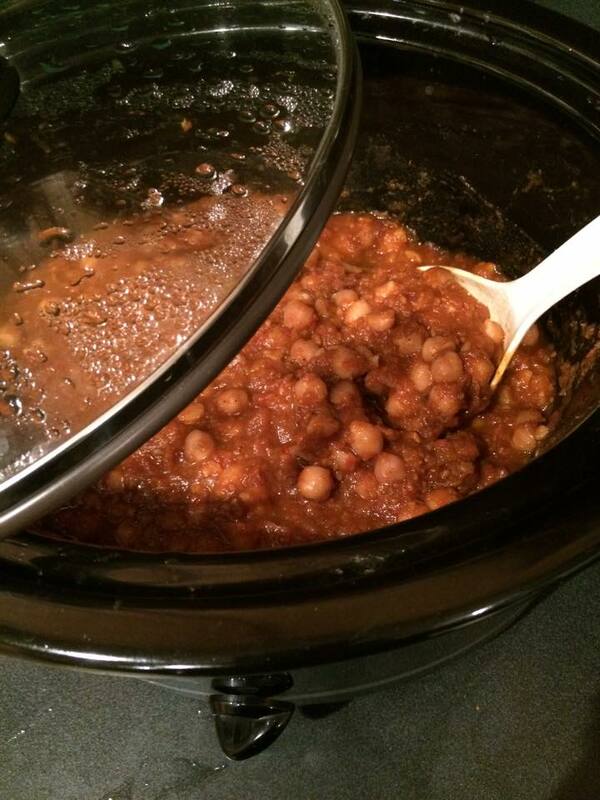 On a hunch, I went ahead and made channa masala yesterday via this method. Here is what I did. So, the quick and usual method of gravy happens. Chop one onion (garlic-ginger is optional), saute in a bit of oil, add jeera and a bit of salt and push it all around till it turns pink. Then add a chopped tomato, sprinkle some water, cover and stare at it a few minutes so it withers and pulps down 😉 Alternatively, you can use a few hefty spoons of crushed tomato from the can. Remove cover, mash, add green chillies (this adds a different taste) OR red chilli powder (this is a whole different taste – you pick) add some amchur powder (for tang, skip if u don’t have), and get MDH’s channa masala powder. I don’t measure well, but I’d say use a small spoon (like they give u at the FROYO places) – about 1/2 tsp. Give it all a quick mix and let it come together. Shouldn’t take you more than a few minutes. I like to fry the onion till the rawness disappears. 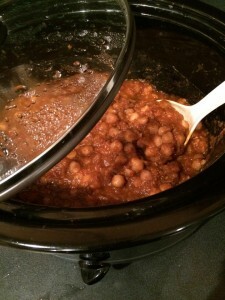 There’s one food blogger (who shall not be named) who threw in every single one of the ingredients in the slow cooker and went about her way and claimed the chole were great for dinner. I am dubious and will not waste my time or plump good channa to try and prove or disprove her. I stick to my common sense that onions need to be broken down and the sulphur needs to go before it goes into me. but that’s me. So, add all the masala, tomato gravy, cooked soft chole together into the slow cooker. Stir well. One little trick I learnt is to start the cooker off, let it warm a bit, drizzle a bit of oil and just a wee bit of water, let that heat up and THEN add this mix in. or you may have a charred mess when you come home. Start the cooker on slow cook(not high cook), smash a few channa down to a pulp and throw it back in, give it a good stir, add a glass of water, close and go do your thing. After whenever you decide to come back, open, stir it all together, smash 4 elaichi pods and add that in. I like the flavor. Do a taste test. Slow cooking usually needs a little more spices. Coz its all going in and soaking and ok, i have no idea why, but it does ok! (see, am honest) – you add some salt and some more masala powder on the top, mix well, and serve away. 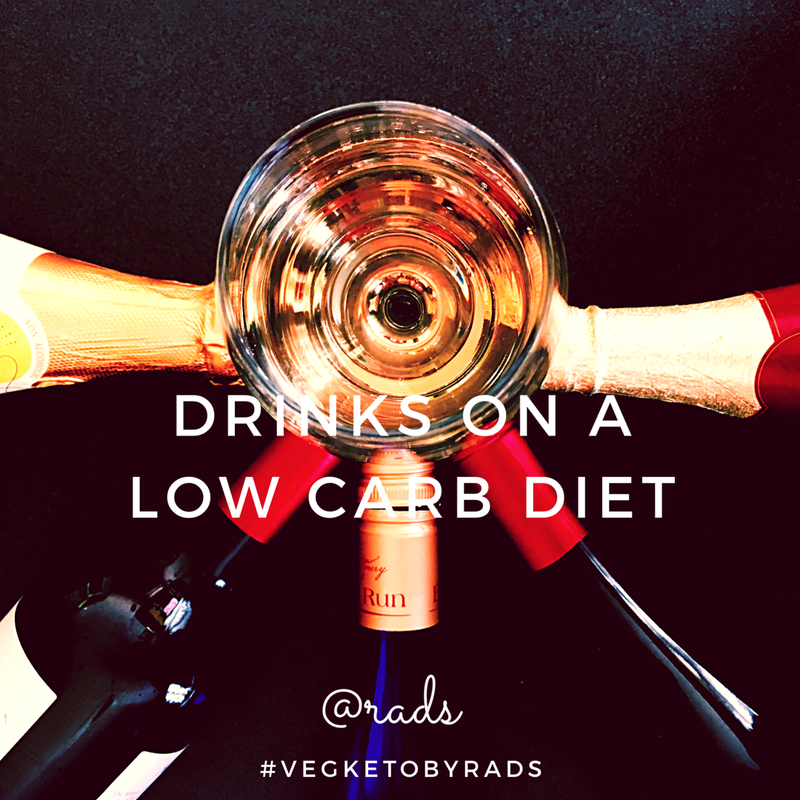 Rice, roti, puri, naan, whatever works. No amchur? it’s ok. Squeeze lime at the end. Replace channa with rajma or any other bean, works the same way. Green peas will require much shorter cooking time though. Tomatoes have this acid that won’t let lentils/beans/peas to cook well. Hence cook ahead and then add. I usually just throw beans with water a bit of baking soda and pressure cook them for 5-6 whistles either at night for next day or first thing in the morning, or use a can. I have a fairly large crockpot, Hamilton Beach. The container is stone I believe. It’s pretty darned heavy. The point is to make sure you coat the bottom, and there is enough water to cover the beans, before you shut it and forget it. The point is, the gravy needs to be enough for the peas and vice versa. Previous articleAdoption Story: So, What’s Her Story.